Your dining room can be the heart of your home. It’s where you host dinner parties with friends and big family dinners every week. It’s also where you host holiday dinners and form life-long memories. Your dining room needs to be able to accommodate all your loved ones and make them feel cozy. The design of your dining room table is just as important as its size. The look of the table can impact the look of the whole room, which can make it seem more or less inviting. The design can also reflect your personal style. Traditional dining sets are essential static. They have four legs and a table top, and they don’t change size or shape. Modern dining sets, on the other hand, transform in a variety of ways. Coffee tables can raise up and out to turn into dining tables. A small desk can expand to a dining table that can seat up to 12. Console tables have leaves that fold up and turn them into dining tables that seat six. Modern design lets you turn a variety of other tables into a modern dining table and chairs. You have the flexibility you need to fit small and complex spaces. You can instantly creating a dining area where you previously had none. Or you can use these transforming tables to free up space during the day when you are not dining. The key is that you have the flexibility to choose. Most traditional dining table and chairs sets are big and bulky. They are made of thick wood panels and posts, and they have over-the-top details like fluted legs, scalloped edges, and engraving. While some people may like this look, others think that it looks old-fashioned. Traditional dining sets can look out of place in contemporary homes. Modern dining sets have sleek designs and clean lines. Their simple profile fits into any contemporary decor scheme. They are made of a variety of materials, including steel and glass, and they have slim profiles that only enhance the setting, rather than detract from it. You won’t find frilly and ornate designs on modern dining sets. They don’t have fancy edges, routed legs, or engravings. Instead, they have flat surfaces and straight lines. The geometric designs look modern and sophisticated, and they effortlessly improve the profile of your dining room. Traditional dining sets were made of one material: Wood. The finishing options for traditional dining table and chairs sets included different wood stains. Some were painted after the fact, but they retained that rustic look and had the wood grain intact. Modern dining table and chairs sets come in a much wider variety of finishes. You can purchase modern dining sets in any color of the rainbow. The tables are finished in smooth, glossy panels that have a beautiful look. You can also choose paneling that looks just like natural wood grain. You have many more options for matching your decor and creating just the look you want. So what kind of look do you want for your home? Do you prefer the look of traditional dining sets, or do you like the sophisticated look and flexibility of modern dining sets? 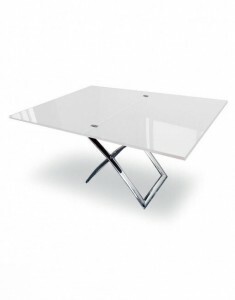 Expand Furniture offers a variety of space saving tables that are perfect for contemporary homes. These modern dining sets start life as coffee tables, consoles, or individual desks, and they expand to seat a full family. You can use them to make the most efficient use of your space if you have a small home or just to keep clutter to a minimum in your larger home. We also sell a variety of other space saving furniture to help you maximize the use of your space. All of our pieces are made of high quality materials and feature modern design. 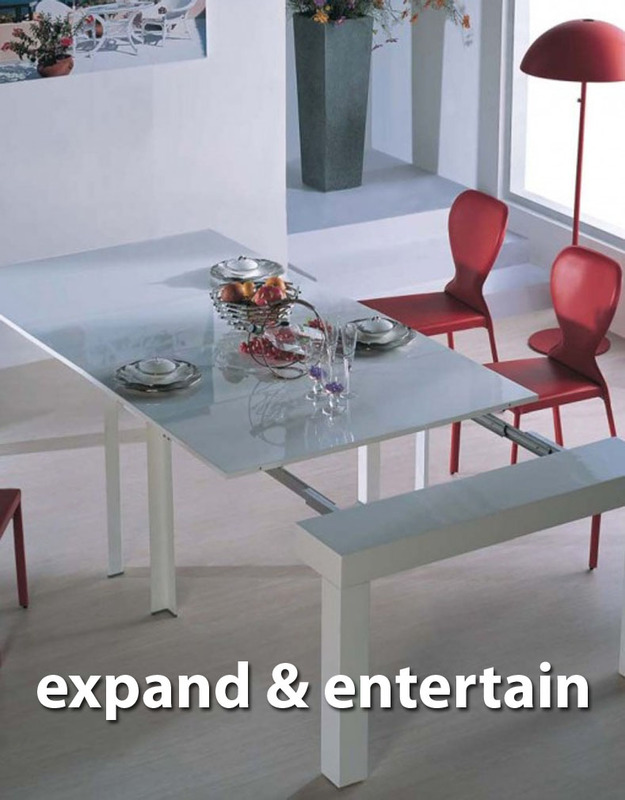 Explore our catalog to find the perfect dining set or other furniture for your home or contact us for more information.